Another fine day dawned and Sarah dropped me at Banbury Station, quite close by, on her way to do a heap of tasks before her day started. 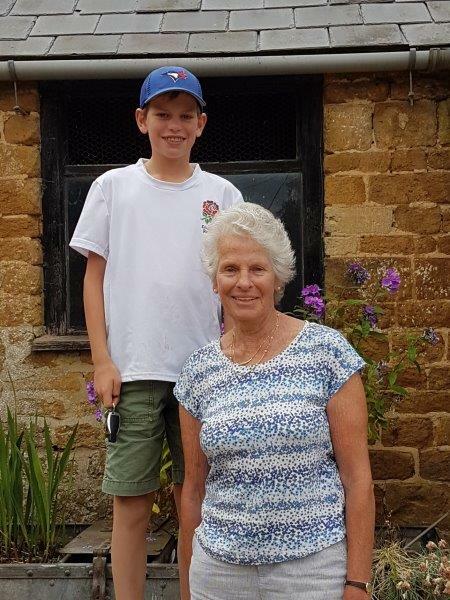 Quite soon, as if by magic, Di (my sister-in-law) and her grandson, James, arrived to sweep me up and take me to her home for a great wander around the farm and for a light lunch. School holidays had begun and Di was all set to take James, a keen cricketer, to one of his many cricket matches that evening. 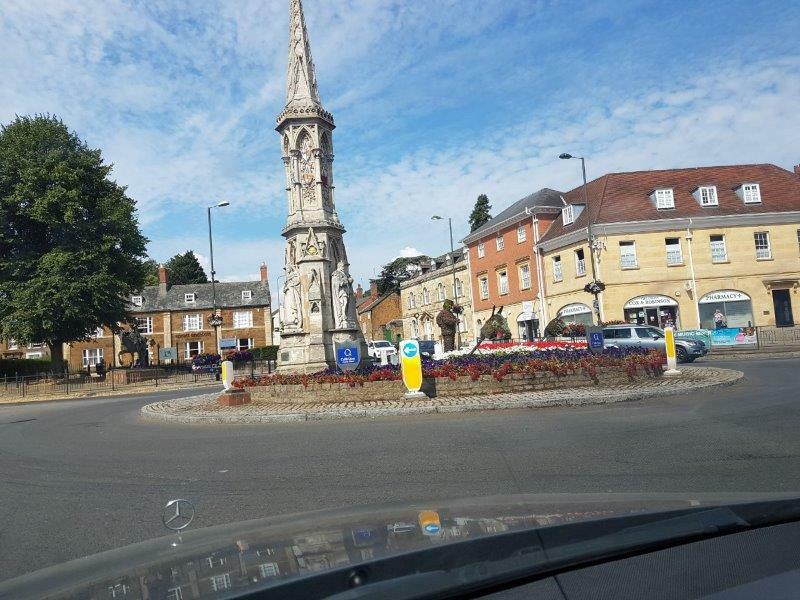 On the way home we drove past Banbury Cross where a recent addition of a soldier holding a rifle, made entirely out of carpeting was an interesting new sight. The soldier is just to the right of the yellow bollard in the middle of the photo. It was great to be out in the sunshine on such a beautiful day and to stroll around the farm, close to where Ken spent his childhood and went to school. Cotswold buildings are so beautiful and the houses in this idyllic little village lived up to standard of beauty that can be found on all sides. Time passed all too quickly and it was soon time to take the train from Banbury back into London, this time to stay with 'Tricia in Pimlico. 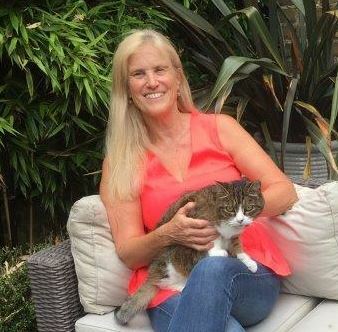 We first met in 1962 at our first jobs in London and we have been friends ever since, including spending a wonderful holiday together in Italy when we were still in our teens. As it happened I had already arranged to spent much of Wednesday catching up with some special relations and it wasn't until Thursday that we could spend some quality time together. 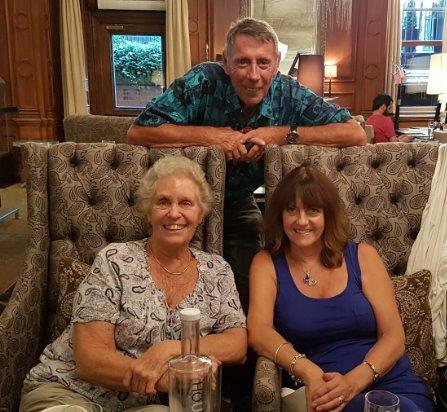 So, on Wednesday I travelled once more to Marylebone to the Landmark Hotel, this time to have lunch with two of my cousins on my mother's side of the family. 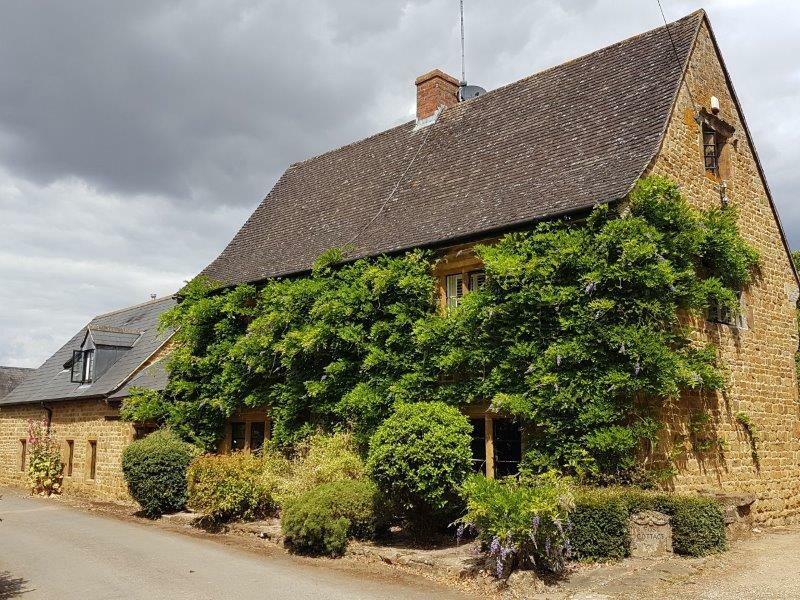 Geoffrey lives in Peterborough, a cathedral city in Cambridgeshire, and Rowena comes from a tiny village called Bryants Bottom near Great Missenden in the Chiltern Hills in Buckinghamshire. Both had taken the time and trouble to take trains into London so that we could have some time together and it was a lovely reunion with simply heaps to catch on after more than four years apart. It was a very long and very enjoyable lunch! With both of them on their various trains home, I took the tube to South Ealing. I've realised that I really, really like travelling on London tubes. They're so efficient, fairly clean, get you where you want to go quickly and easily, run frequently and are generally pretty comfy. 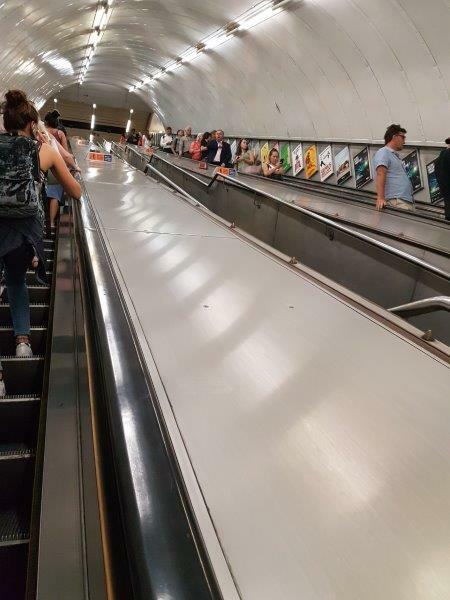 The escalators between lines are absolutely enormous and seem to go on for ever. This one wasn't very crowded and I wasn't at the very bottom when I took the photo, which gives some idea of the scale of the whole network. It's true that in the summer heat it can get pretty warm underground but the trains on some of the lines are air conditioned which makes the travel very acceptable. I made my way to visit one of my cousins on my father's side of the family. Juliet works full time managing a range of musical artists so she has very little free time but we had a lovely afternoon and evening together, just chatting and catching up. I was sad to leave and make my way, on the tube of course, to Pimlico and a waiting 'Tricia. Unfortunately 'Tricia was not at all well this year so activities were somewhat constrained. 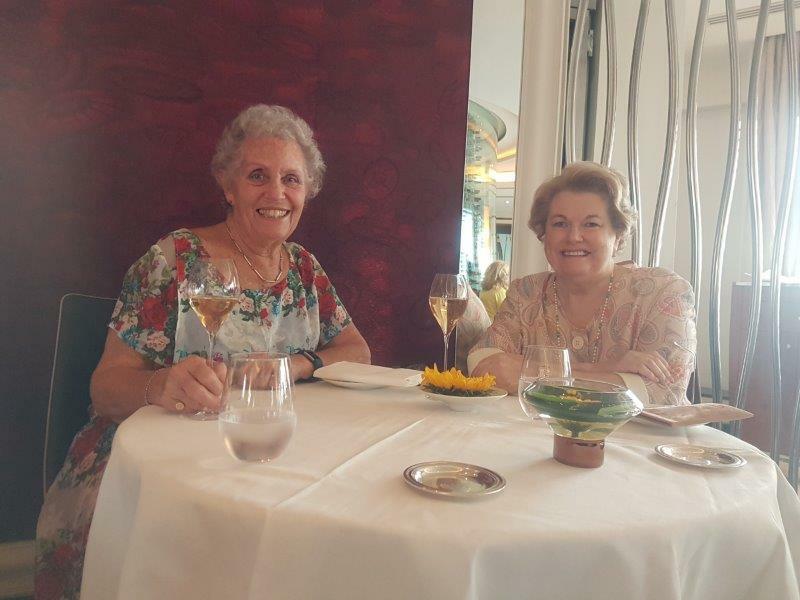 She told me that she had booked for us to go out to lunch at a 'very smart restaurant' which was going to be a surprise and that in the evening she had arranged for us to play bridge at the RAC Club. In the event lunch alone proved almost too much for her and she just managed to get home and 'collapse in a heap' so we had a quiet evening instead and I taught her how to play backgammon! 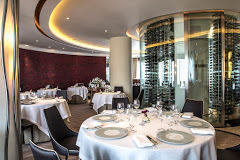 Lunch was certainly a surprise when the taxi dropped us off at Pétrus, Gordon Ramsay's Modern French fine dining restaurant in Belgravia with a centrepiece glass-encased wine room. 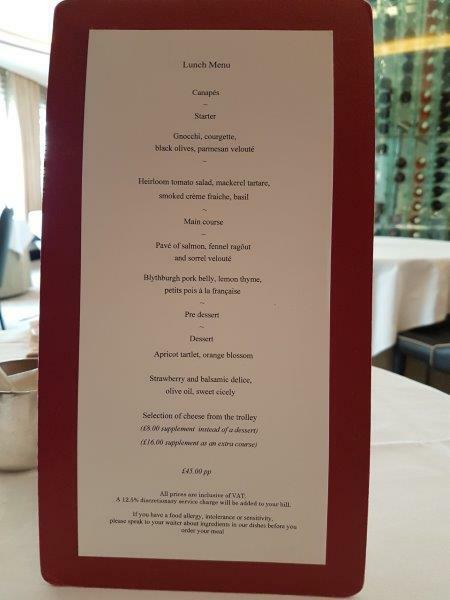 The menu was glorious and the presentation of the food as remarkable as it is at any Gordon Ramsay restaurant (this is only the second time I've been to one in London!). 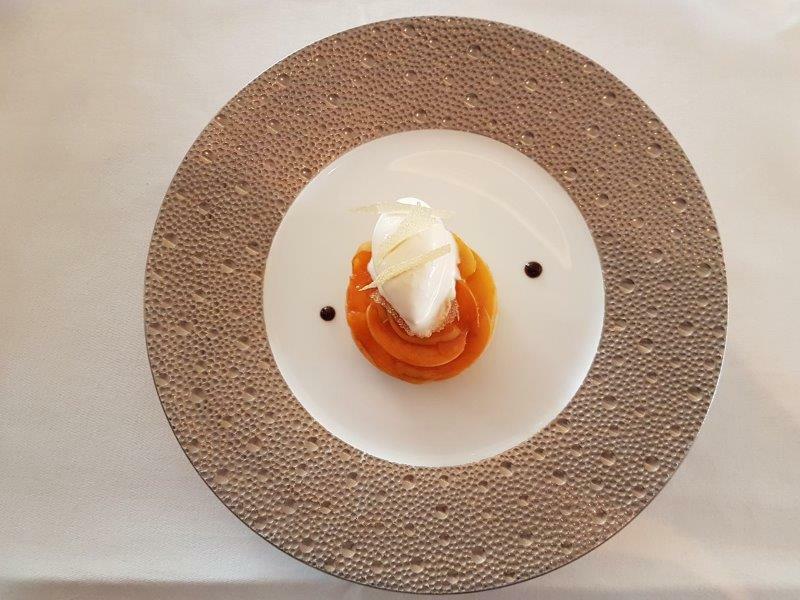 Of course the service was unbelievable and the waiters trod a fine line between serious service and gentle ribbing which was very cute. We began with a glass of champagne each, to celebrate our reunion, and then the eating began. I'd arrived in England pretty proud that I'd shed about 12kg after a long period of carrying around too much weight. 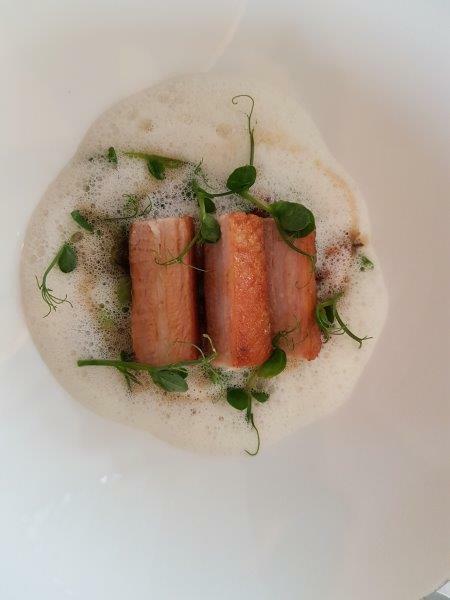 However, if I go out to many more meals like this one I shall go back to New Zealand and have to start all over again! 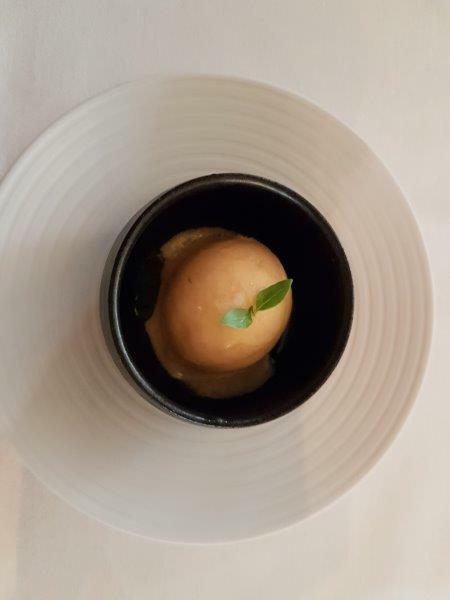 The food was so fabulous that I found myself taking photos of each course and here they all are! From left to right, a complimentary canapé which contained all manner of delicacies, one of which was foie gras! 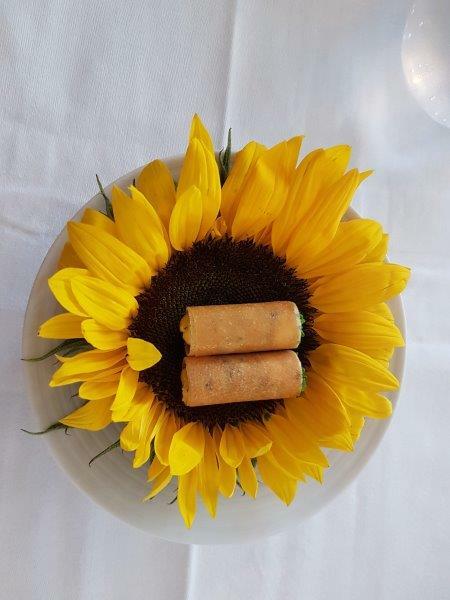 It was served, as you can see, on a giant sunflower head. 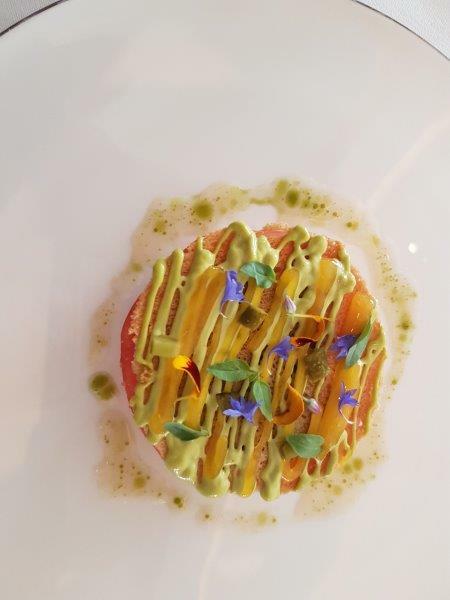 Next was an heirloom tomato salad, mackerel tartare, smoked crème fraiche and basil, then Blythburg pork belly, lemon thyme petits pois à la française followed by a complimentary sorbet to cleanse the pallet and finishing with apricot tartlet, orange blossom. Amazingly, all the servings were fairly small so neither of us felt full to the brim, just deeply satisfied! So ended a very happy visit and a sincere hope that 'Tricia's health will start to improve and she'll be in much better health next time we catch up. Original generation time 1.6166 seconds. Cache Loaded in: 0.0512 seconds.